Samuel Palmer (1805–1881), Sir Guyon with the Palmer Attending, Tempted by Phaedria to Land upon the Enchanted Islands (1849), watercolor and bodycolor, with some gum arabic, over black chalk underdrawing, 53.7 × 75.1 cm, The J. Paul Getty Museum, Los Angeles, CA. Courtesy of The J. Paul Getty Museum. Samuel Palmer’s paintings during his Shoreham period were views of an enchanted countryside, as visionary in their way as William Blake’s work. When he returned to live and work in London, in 1835, he had to face the reality that visions seldom bring sales. He had already travelled to Devon in the previous summer, to start painting topographical views, and now set himself on a course to develop his art in that direction. In this, Palmer started at a disadvantage. Leaders in the field, such as JMW Turner, had long abandoned painting familiar and accessible areas such as the south of England, and had been busy producing views of continental Europe and beyond. Palmer would have to find new locations to inspire him to produce landscapes which would appeal to the London clientelle. He chose North Wales, where in the summers of 1835 and 1836 he saw and painted ‘grand novelties & enlarged the materials of imagination’. Samuel Palmer (1805–1881), Pistil Mawddach, North Wales (1835-36), watercolor, gouache and graphite with scratching out on medium, cream wove paper, 44.1 x 53.3 cm, Yale Center for British Art, New Haven, CT. Wikimedia Commons. Among the locations which he found was Pistil Mawddach, North Wales (1835-36), shown here in his initial watercolor painting. This waterfall, known now as Rhaeadr Mawddach, is on the upper reaches of the River Mawddach near Snowdonia. At the time it was far less known than the nearby vertiginous mountains of the Snowdon range. 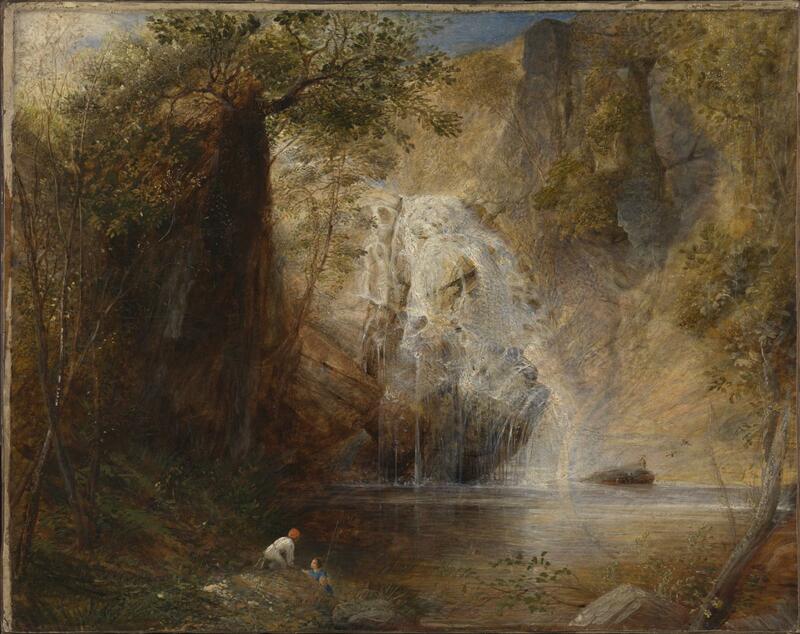 Palmer seems to have visited the falls a second time in 1836, and then to have painted a finished version in oils, The Waterfalls, Pistil Mawddach, North Wales (1835–36). 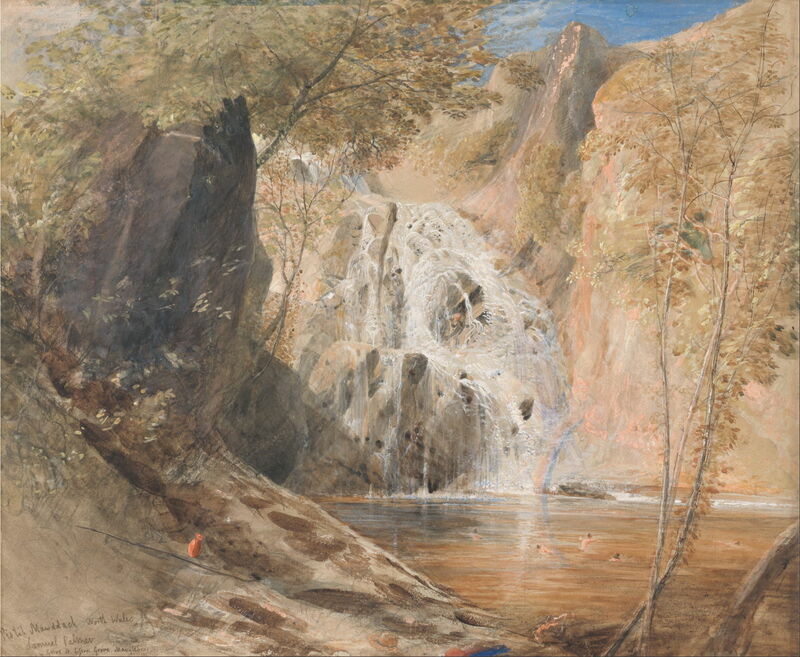 Given that this painting may have been based on further sketches and studies, and was probably created the following year, the similarities between these two works gives insight into how faithfully Palmer was painting from nature. Samuel Palmer (1805–1881), Rocky Landscape in Wales (1835-36), gouache and watercolor with traces of gum and black chalk on moderately thick, slightly textured, cream wove paper, 37.9 x 47.9 cm, Yale Center for British Art, New Haven, CT. Wikimedia Commons. 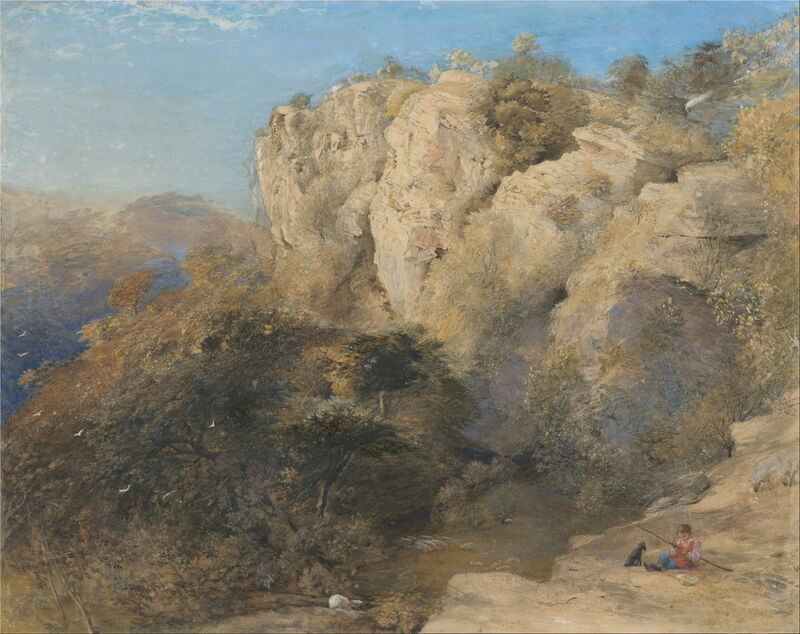 He also painted dramatic scenery of the ‘sublime’, such as views of Snowdon from Moel Siabod, Conwy Castle, and this Rocky Landscape in Wales (1835-36), all in watercolour. In 1837, Palmer married his mentor John Linnell’s oldest daughter, Anny. A few days later, the newly-weds joined George Richmond and his family, and left London on a paddle steamer bound for Calais and the long overland journey to Italy, on an extended working honeymoon. After a brief stay in Paris to admire Venetian art in the Louvre there, they crossed the Alps to Milan, Florence, and eventually reached Rome. They met Edward Lear, the writer and watercolourist, and Palmer obtained a commission to paint for the banker John Baring. 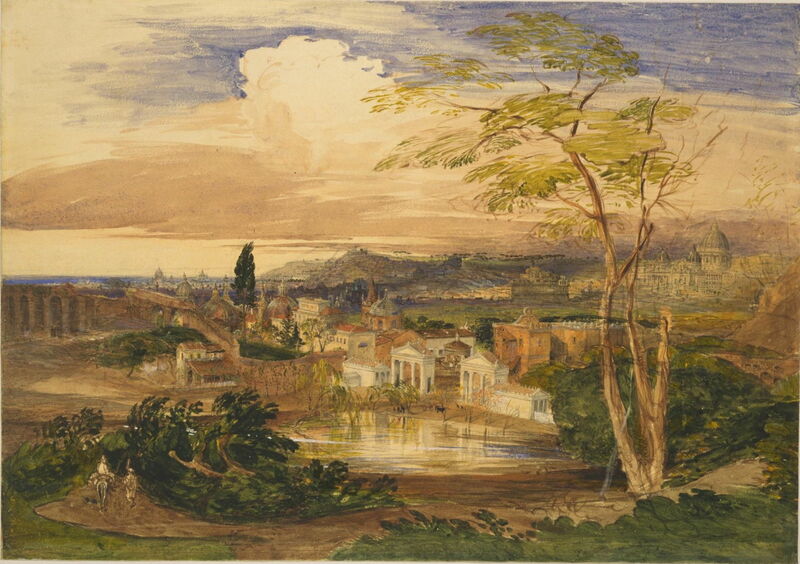 Samuel Palmer (1805–1881), Rome from the Borghese Gardens (1837), watercolour on paper, dimensions not known, The Victoria and Albert Museum, London. Courtesy of and © Victoria and Albert Museum, London. Palmer’s paintings during his extended honeymoon vary more in their quality, and seldom show his earlier vision. Rome from the Borghese Gardens (1837) is a pleasant watercolour, but hardly in keeping with his views from North Wales. 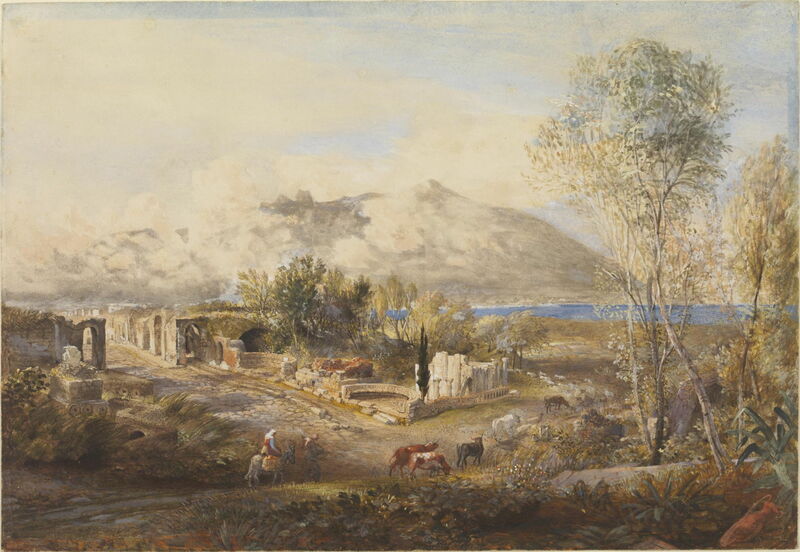 Samuel Palmer (1805–1881), Street of the Tombs, Pompeii (1837), watercolour on paper, 28.2 x 22.3 cm, The Victoria and Albert Museum (Presented by Mrs J. Merrick Head), London. Courtesy of and © Victoria and Albert Museum, London. Street of the Tombs, Pompeii (1837) shows more eloquently the ruins of Pompeii in the foreground, with the backdrop of the volcano Vesuvius and a sliver of deep blue water cut in. Other sketches, such as this promising view of The Colosseum and the Arch of Constantine from the Palatine, Rome (1837–39), seem not to have been developed into finished watercolours. After the Palmers had stayed in Naples for a while, they returned via Tivoli to Rome, where they made small-scale copies of Raphael frescoes for father-in-law John Linnell. They then turned for home, travelling intermittently, and visiting Civitella, Papigno, and Florence, where they copied a Michelangelo in the Uffizi. Their return to London in late 1839 posed Palmer the problem of how to generate the income which his family needed; its solution lay in sinking into the same ‘pit’ which he had sought to avoid for so long. 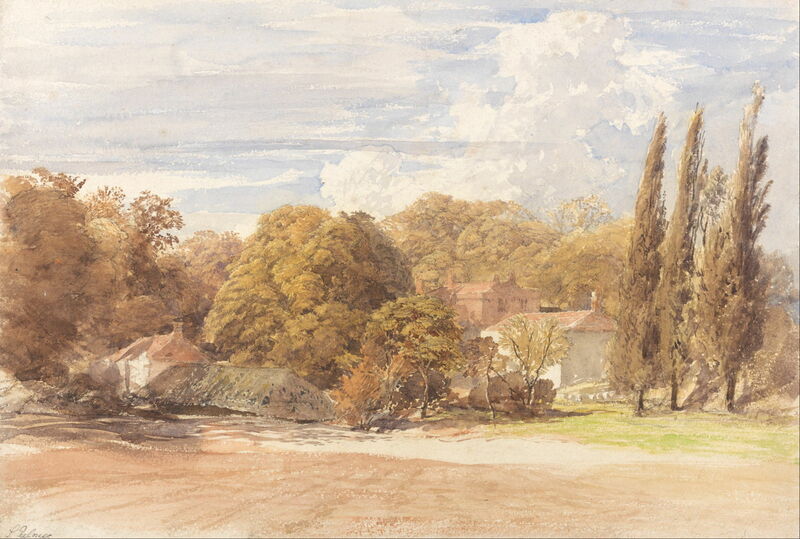 He still travelled, spending summers in Shoreham, Wales, and the West Country, and in 1843 was made an Associate of the Old Watercolour Society, which afforded him valuable professional recognition at last. He completed a commission of four vignette illustrations for Dickens’ Pictures from Italy, but did not secure any follow-up work as a result. Samuel Palmer (1805–1881), Kensington Gardens (c 1848), watercolor over graphite on thick, slightly textured, cream wove paper, 25.7 x 37.1 cm, Yale Center for British Art, New Haven, CT. Wikimedia Commons. Paintings such as his Kensington Gardens (c 1848) demonstrate Palmer’s skill in watercolours. He used ‘advanced’ techniques which we now appreciate more in the works of JMW Turner and Winslow Homer, and his more ambitious and inspired paintings competed in their effect with oils. 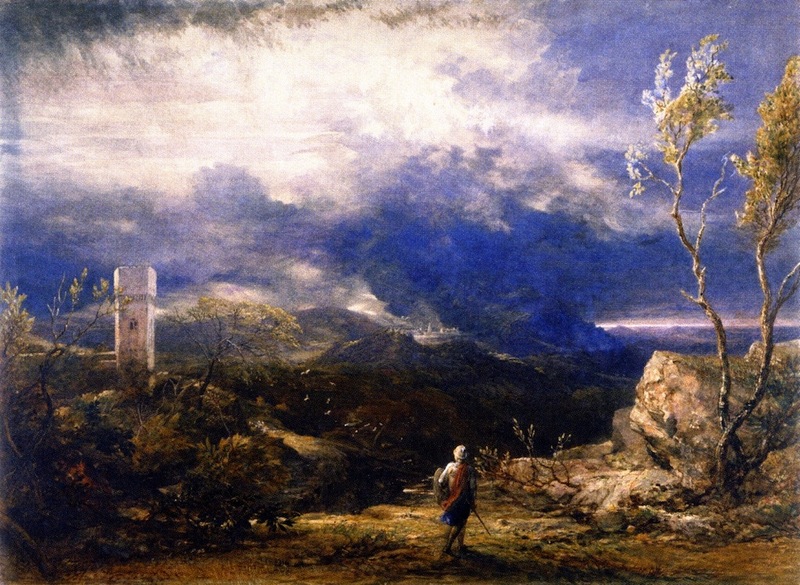 Samuel Palmer, Christian Descending into the Valley of Humiliation (1848), watercolour, 51.9 x 71.4 cm, Ashmolean Museum, Oxford. WikiArt. Christian Descending into the Valley of Humiliation (1848) is a good example. In the late 1840s he consciously sought a new style, in which capturing impressions of transient light and atmospheric effects became more important, and this helped him achieve full membership of the Old Watercolour Society in 1854. Sir Guyon with the Palmer Attending, Tempted by Phaedria to Land upon the Enchanted Islands (1849) is another highly accomplished watercolor from this period, showing an unusually sophisticated scene. This refers to a story told in Edmund Spenser’s The Faerie Queene, an epic poem which was first published in 1590. This consists of a series of books, each telling of knightly adventures which centre on a specific virtue. Sir Guyon is the Knight of Temperance and hero of Book 2. In Canto 6 of that book, Phaedria ‘the shining one’ is giggling and singing to herself in a small boat in a river. Having taken another (Cymochles) to an island which entices all the senses, she meets Sir Guyon and the Palmer (an old man holding a palm branch who has been on a pilgrimage to the Holy Land). In Spenser’s poem, Phaedria gives Sir Guyon a ride in her boat, but refuses to carry the Palmer. She takes Guyon to the same enticing island, rather than just across the river, which upsets him. When delivered to the island, Cymochles and Sir Guyon fight one another, until Guyon shatters Cymochles’ helmet. Palmer shows Sir Guyon and the Palmer standing in one boat at the left, being rowed by a woman. Phaedria is standing in her own boat in the middle of the water, and the enticing island lies behind, with nymphs dancing in the light of the setting sun. 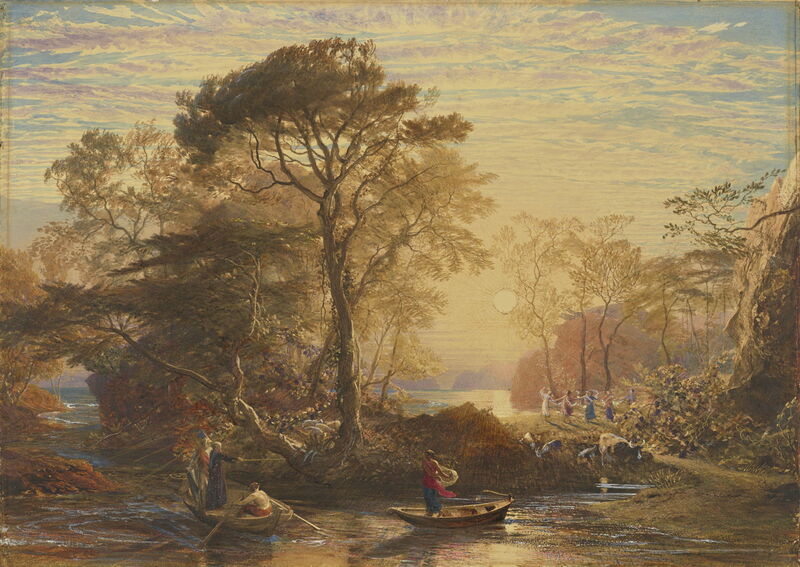 Although its story was even then fairly obscure, Palmer’s watercolour is a remarkable achievement, rich in details such as the fine rays of the sun over the land and water, and with an extraordinary sky. For Palmer, though, success with his peers and critics still did not bring him the sales that he needed. He continued to rely on teaching, which he had started in 1832, to pay the bills incurred by his family. In 1849, Palmer took up etching, which became a rare treat. He approached it not as mechanical reproduction, but as another medium in which to express himself, and was admitted to the Etching Club at a time when the revival of etching as art was starting. Although he produced few etchings, and his early small prints were not a success, later and larger prints were exhibited at the Royal Academy. Samuel Palmer (1805–1881), Wilmot’s Hill, Kent (c 1851), watercolor and gouache over black chalk on medium, slightly textured, beige wove paper, 27.3 x 37.5 cm, Yale Center for British Art, New Haven, CT. Wikimedia Commons. 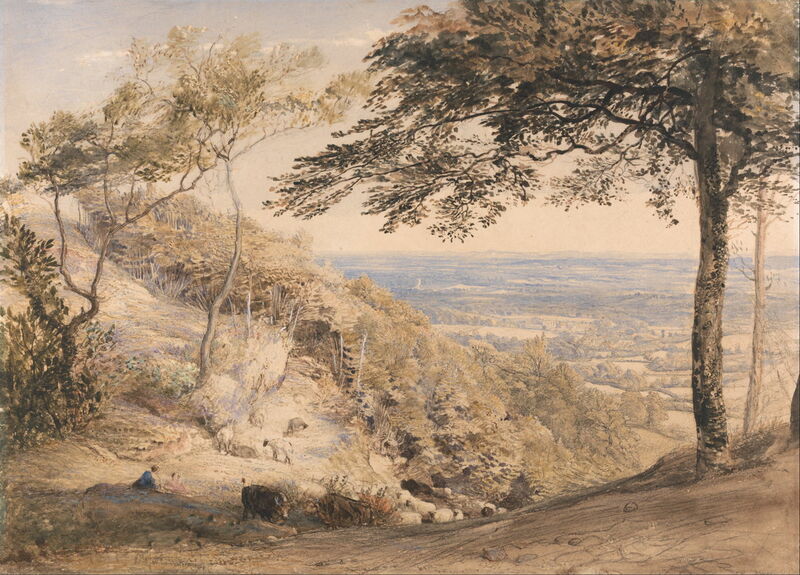 In the 1850s, he returned more to the rolling downs of the Kent countryside, where he painted this delicate view from Wilmot’s Hill, Kent (c 1851), which makes interesting comparison with his paintings from his time at Shoreham. Samuel Palmer, Summer Storm near Pulborough, Sussex (c 1851), watercolour on paper, 51.5 x 72 cm, Art Gallery of South Australia, Adelaide. Wikimedia Commons. 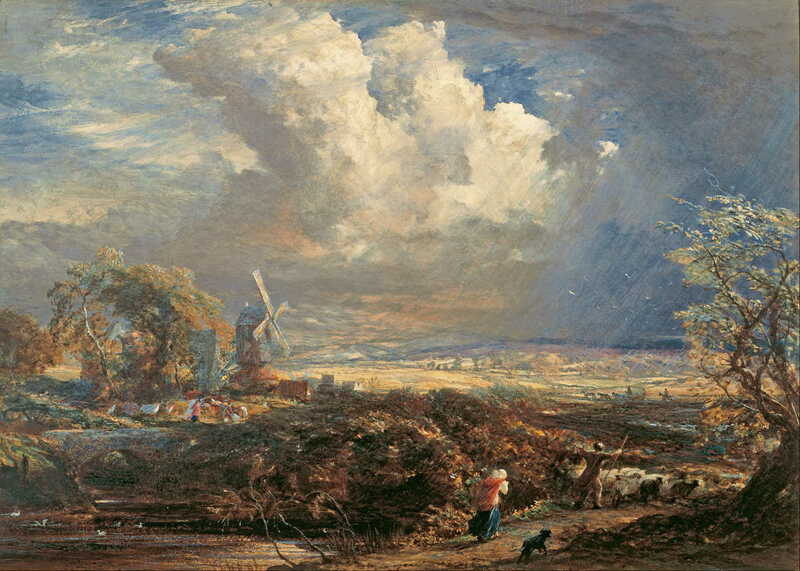 He still sought – and sometimes captured – fleeting effects of light and the weather, as seen this powerful watercolour of a Summer Storm near Pulborough, Sussex (c 1851). Samuel Palmer (1805–1881), The Rustic Dinner (c 1853), watercolour on paper, 53.3 x 75.5 cm, Art Gallery of South Australia, Adelaide, Australia. Wikimedia Commons. 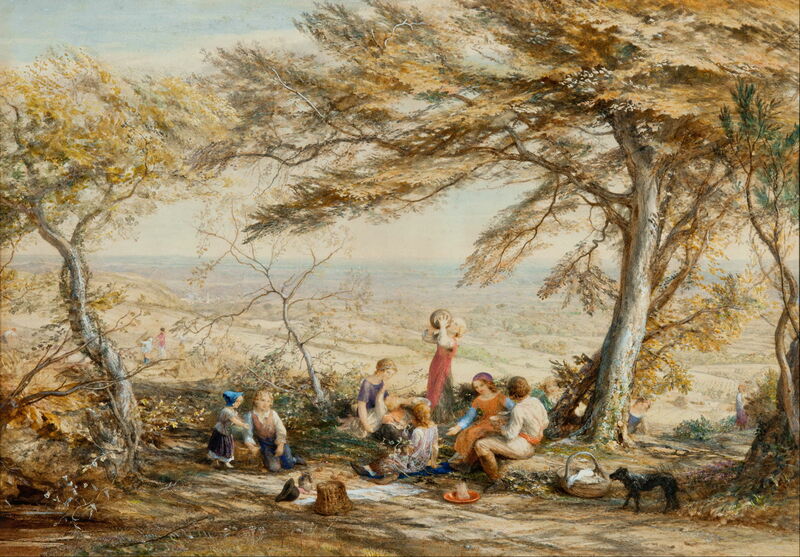 But those visionary views from the downs near Shoreham from early in his career were long since replaced with works like The Rustic Dinner (c 1853), from quite a different league. Vaughan, William (2015) Samuel Palmer, Shadows on the Wall, Yale UP. ISBN 978 0 300 20985 3. Posted in General, Painting and tagged Ancients, Blake, Homer, landscape, Linnell, painting, Palmer, Turner. Bookmark the permalink. Why can’t I find anything useful in Sierra’s logs? All About This Mac: where to find that UUID, MAC address, etc.